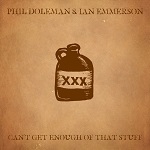 The follically challenged Phil Doleman and Ian Emmerson have released this nice little EP with six blues tracks. Phil used to perform a lot of music with Ian, and they've recently got back together with this being one of the products. Every single note is perfectly placed and timed, with Phil's characteristic sound coming through and his confident vocals as ever work so well. Emmerson's backing guitar is like a comfy shag pile carpet to underlay Phil's top end ukulele. I've attended one of Phil's workshops for finger picking techniques, and I've still not managed to get anywhere near Phil's technique and spot on timing. Ian actually gets to sing harmonies on "Fine Artiste Blues" and "Trouble In Mind" and proves himself as a fine artiste himself. My only criticism might be the quality of the sound recording, but really it's like being in Phil's front room, making it very real, and he does say in his own description of the EP that it's "all recorded the old-fashioned way- live into one microphone.". That's the ambience they wanted. As ever, ukulele music doesn't mean that guitars should be excluded, and this is a nice mix, neither instrument is fighting for attention, it all blends together just nicely. And I just love that little riff -1-2-3-4- in "Police Dog Blues". Go to buy it from Phil's website where his other CDs are also available. Hey, that dog "Rambler" sounds rough and tough, but I'd face up to him, no problem. He's no match for me. GRRRRRR!